← Help us help San Diego! Thank you in advance for your consideration of my comments on The Draft San Diego Forward: The Regional Plan and Draft Environmental Impact Report (DEIR). While I serve as a volunteer member of the Board of Directors of the Cleveland National Forest Foundation, I submit these comments in my individual capacity as a 20-year resident of San Diego County. I am a parent, taxpayer, and citizen engaged in volunteer efforts to advance social justice and environmental protections. I want San Diego to be an amazing place for tourists to visit, but primarily I want the region to be the best it can be for current and future residents from all walks of life who call San Diego home. With great power comes great responsibility. SANDAG is one of our region’s largest agencies, and you are responsible to use the full extent of your expansive budget, power, and influence to serve the best interests of all San Diegans. Some of you, in your official capacities as SANDAG board members or representatives, have made public claims that the agency’s role is limited in scope and responsibility. When you attempt to limit SANDAG’s great potential to make a beneficial difference on climate at this critical time in history, you are shamefully abandoning your political and professional responsibilities. You are choosing politically charged language to abdicate your duties to we, the people who live here, who are impacted daily by your decisions and pay your salaries, and you are doing so in order to maintain a fundamentally broken approach to transportation planning. It is a failure of leadership. In analyses of various mobility options to serve the growing San Diego population, the presupposition is that SANDAG must build roads. No other approach to moving people and goods throughout the region is given equal consideration. The “balance” you acknowledge you must consider and implement to provide a variety of transportation options to serve the whole of San Diego’s population has long been weighted in favor of roadways. This is a failure in your own terms when you use the word “balance.” ‘Widen freeways now and promise a few transit projects later’ is insufficient to actually provide a variety of functional mobility options, and you are far overdue to shift the priority to other modes of transport to correct the imbalance. The longer you delay implementation of functional, integrated transit, the more it will cost. It is imperative to prioritize transit infrastructure now, without further needless delay. Your bias favoring roads has served to create polluting congestion with limited non-car options that is our current reality. This continued approach does not take into account one of the most important segments of our population: the young who will be middle aged and older adults by the time many of the roadways projects listed in the DEIR will be built, and who have a declining interest in personal car ownership and driving (Exhibit “A” The Clearest Explanation Yet for Why Millennials are Driving Less, CityLab, July 13, 2015). We can’t pave our way out of the current problem, and more pavement certainly will not serve to reduce regional greenhouse gas emissions, stormwater runoff pollution, nor traffic congestion (Exhibit “B” The One Chart That Explains All Your Traffic Woes, CityLab, March 2, 2015) and will not adequately serve the San Diegans of the future. Clearly, as referenced in Figured 4.8-1, priorities must shift if we ever hope to reach the greenhouse gas reductions targets necessary to achieve climate stabilization. There is a remedy. It is an approach to transportation that can exceed state emissions reductions requirements, provide complete mobility choice, benefit the local economy, and protect San Diego’s future without expanding roads and their negative impacts. You, our heavily funded transportation agency, are obligated to study it, seek federal, state and local funding for it, and prioritize implementation of it. Your current proposal contains all the same road-based projects as the prior iteration of the RTP, although as the years have passed cost projections have increased. Thus, transit projects have been removed (including the incredibly important below-grade transit station at UTC) in the DRTP to fund your hallowed freeways, and the region thus fails to meet regional greenhouse gas emissions reductions targets set by Executive Orders S-3-05 and B-30-15. 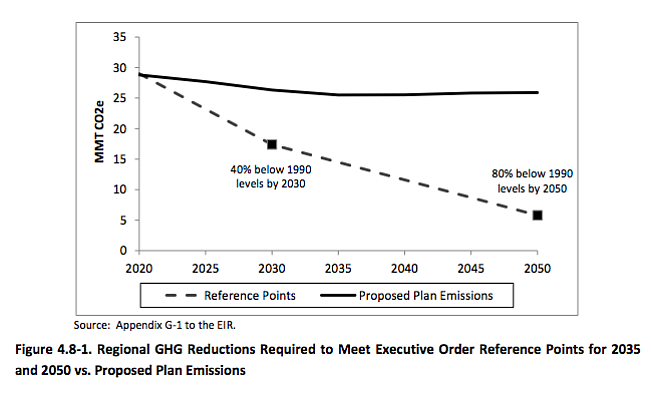 While it is not currently a requirement for SANDAG to adhere to the additional emissions reductions set forth in S.B. 32 (Pavley) (which, if passed and signed into law will go into effect January 2016), the trends are clear that California’s legal framework is evolving to include increasingly stringent requirements to limit climate impacts. The writing is on the wall. You, our leaders and representatives at SANDAG cannot continue to plan in a vacuum as though scientifically deduced targets for the continued viability of humankind are arbitrary guidelines to be ignored. While some of you give lip service to such principles as “Vision Zero” and its goal of zero pedestrian and traffic deaths, you continue to perpetuate the paradigm that can only induce more traffic-related deaths; not only from collisions, but also the slower forms of death caused by particulate matter emissions from vehicles powered by fossil fuels. Much like the discussion of human health impacts in the DRTP concluding in a veritable shrug (‘impacts are inevitable, because we build roads’), you among SANDAG leadership refuse to meaningfully study or adopt any vision for the region that does not include an expansion of existing freeways. This is despite documented benefits of a no new roads plan to accommodate the transportation needs of the region by maintaining (but without expanding) existing freeways and instead adding significant investments in light rail transit networks and safe active transportation infrastructure. Although presented to SANDAG on multiple occasions by various individuals and organizations, I include here a copy of the Cleveland National Forest Foundation’s 50-10 Transit Plan: A World Class Transit System for the San Diego Region (Exhibit “C”), which lays out the feasibility and framework of implementing fifty years’ worth of projected transit in ten years. Realistically, the first phase of such transit investments would build out capacity along existing rail lines within the first ten years, which would lay the foundation for the expansion of the network arterials in the following decade. More recently in April of this year the same renowned expert, Norman L. Marshall of Smart Mobility, Inc., released a supplemental report: “The 50-10 Transit Plan: Quantifying the Benefits,” (Exhibit “D”). The human and environmental benefits of the proposed planning approach as discussed in the new report so significantly outshine those documented in the DTRP, the plan deserves more than a dismissive response by you who hold San Diego’s transportation future in your hands. Roads and rail direct growth patterns, thus San Diego’s land use future is also in your hands. I encourage thorough consideration of the documentation enclosed, primarily the quantification of the benefits of the 50-10 Plan. It is your duty to build mobility options for San Diegans that will not exacerbate greenhouse gas emissions to further degrade our health and increase climate instability. I agree with you completely.There is no way to reduce greenhouse gases without reducing the number of cars. There is no way to do that by increasing freeway lanes. We will have to have some version of the vision you describe. I hope it happens in time.